Imagine a metal asteroid spewing molten iron, and you’ve got the gist of ferrovolcanism — a new type of planetary activity proposed recently by two research teams. When NASA launches a probe to a metal asteroid called Psyche in 2022, planetary scientists will be able to search for signs of such volcanic activity in the object’s past. The new research “is the first time anyone has worked out what volcanism is likely to look like on these asteroids,” says planetary scientist Jacob Abrahams of the University of California, Santa Cruz. Metal asteroids are thought to be the exposed iron-rich cores of planetesimals that suffered a catastrophic collision as the solar system was developing, before they could grow into full-sized planets. The naked core would have been exposed to cold space while still molten. 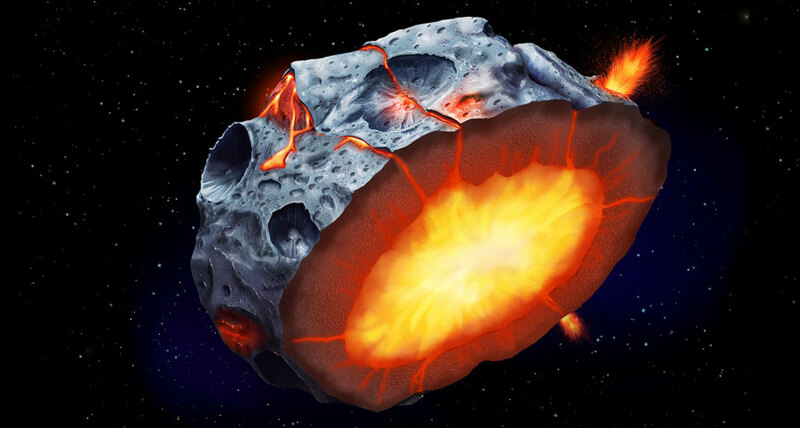 And it would have cooled and solidified from the outside in, forming a solid iron crust that would be denser than the underlying molten iron, say Abrahams and planetary scientist Francis Nimmo, also of the University of California, Santa Cruz. That kind of density mismatch is part of what can create volcanoes on Earth — lighter, more buoyant material rising up through cracks in the crust — and could have led to iron-spewing volcanoes on metal asteroids as the objects cooled long ago, the researchers speculate. Another way that ferrovolcanism could have occurred on metal asteroids was described by planetary scientist Brandon Johnson of Brown University in Providence, R.I. If a cooling iron core also contained a little bit of rock and sulfur, he theorizes, the core could have been cocooned beneath a rocky, not iron, crust. As the core cooled further, pockets of iron-rich liquid with extra sulfur dissolved in them would have hardened more slowly than surrounding materials. Those pockets would be more buoyant than the rock above them, so they’d force their way up and out, Johnson says. If Psyche has such a rocky veneer over iron, that could explain why the asteroid appears much less dense than expected, Johnson says. The two groups, which worked independently from one another, presented their ideas March 21 at the Lunar and Planetary Science Conference in The Woodlands, Texas.